There is nothing like the smell of freshly baking bread. It fills the air with four hours of warmth and coziness that few things in this world can match. But while getting the aroma to waft through the house is easy, making a decent loaf can be a challenge. I’ve created more than my share of hockey pucks and mushroom cloud loaves, so here are my tips for getting the highest-quality results from your flour-filled fun. Tip #1: Choose the right machine. Baking purists will say you should knead the dough by hand and bake the loaf in your oven. 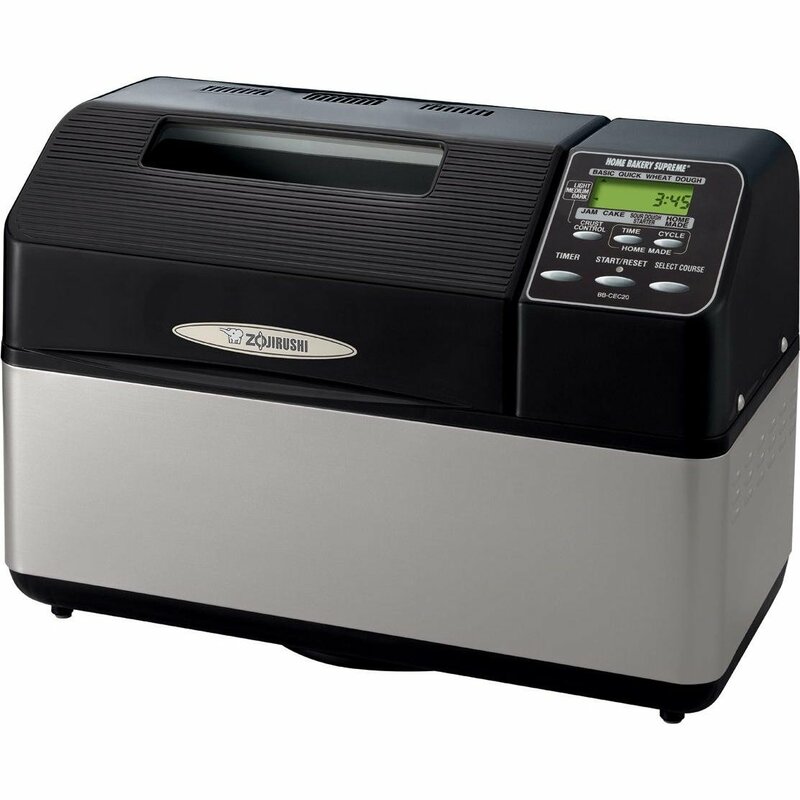 But with today’s technology, you can achieve more consistent results and more precise control using a good bread machine. But not just any old machine will do. My first bread machine was given to me as a wedding present almost 14 years ago. While it served its purpose, the results were always hit or miss, and I wanted something that I could rely on to produce consistent high-quality bread. So I recently purchased the Zojirushi Home Bakery Supreme 2-Pound-Loaf Breadmaker from Amazon.com. At around $250, you might say that it’s overkill. But trust me, the results speak for themselves. The dual-blade Zojirushi Home Bakery Supreme makes rectangular-shaped 2-pound loaves. Two things make this machine awesome. First, it makes rectangular, horizontal loaves, rather than the vertical rocket ships that most machines produce. This result is even baking and a nicely shaped loaf that more closely resembles what you would buy in the store. Second, it pre-heats all the ingredients to the exact right temperature before beginning the process. This is critical, as you’ll see in the next tip. Tip #2: Use the right ingredients in the right way. With only four basic ingredients (flour, water, yeast, and salt), you’d think this would be pretty easy to get right, but bread is a surprisingly tricky thing to make. The key ingredient is yeast, a living organism related to fungi that eats and breathes just like us. It’s this breathing (actually, the process of fermentation) that gives off carbon dioxide gas, which is in turn trapped by the gluten in the flour, causing bread to rise. But it’s also the most finicky of all ingredients. Heat the yeast too high or too low and it won’t rise. You’ll end up with a dense, heavy dough ball. The ideal temperature is usually between 75-85 degrees F. In addition, you must add the ingredients in the proper order. Since water causes the yeast to activate the fermentation process, if the water and yeast come into contact too soon, you’ll get a bad loaf. Generally, you place the water (and any other wet ingredients) into the pan first. Then you cover the water with the flour, and finally add the yeast on top of the flour, being careful not to get the yeast wet. The proportions of the ingredients to one another are also extremely important. Be sure to follow the baking directions from your recipe precisely. Even a tablespoon of water or flour can make a huge difference. Beginners can use an off-the-shelf bread mix with nearly flawless results. As you get more experienced, you’ll want to start experimenting with different flours such as wheat or rye, and tasty add-ins, like fruit or nuts. Note that non-white flours will not rise as much as their traditional counterparts, and most sweet add-ins will also weigh down the loaf. Experiment with different ingredients, realizing that your result may not look perfect but might still be delicious. Tip #3: Let the loaf cool. This last one may seem like a no-brainer, but you’d be surprised how easy it is to ruin a good loaf by attacking it too soon. Once the bread machine is done with its thing, gently shake the loaf out of the pan onto a cooling rack. Use a soft plastic spatula to help get sticky sides off the pan. Once the bread has rested for 15-30 minutes, use a long serrated bread knife to cut the loaf into 1/2-inch slices. If you try cutting it when it’s still hot, you’ll crush and disfigure the bread. Bread making and golf have a lot in common. You can miss the fairway all day, but it only takes one good chip-in to make you keep playing the game. So whatever results you get, be sure to take notes. Just like your golf swing, once you get that perfect loaf, you’ll want to be able to reproduce it every time. I’m sure there are many other ways to achieve good bread baking results – what are some of your tips? Let me know!